I have some random driftwood and peices of elephant stone. Uns controsoil for substrate. Last edited by SCas; 01-14-2019 at 01:23 AM. Looking nice . Can’t wait till to see it when everything fills in. I'd suggest adding a small wavemaker on top of the diffuser to maximize co2 dispersion. Or move it under the HOB flow. 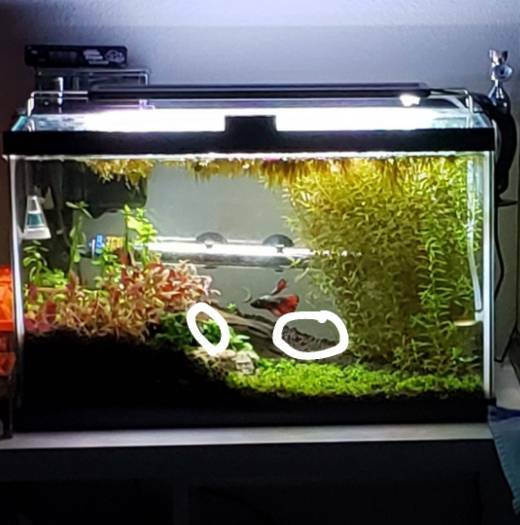 Havnt updated this in a while lol, in this time ive gotten some bacopa monnieri and some proper scisors from nature aquarium and lindernia rotundifolia variegated trimmings from jeffery. Some of the AR mini in the corner started dying so i moved the light and ill have to see how it does. How about a crypt or a sword?